What? 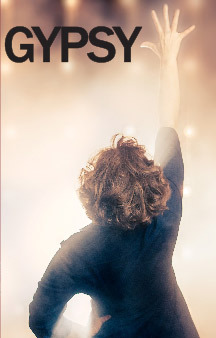 From the show website: From four-time Tony Award-nominated composer Jeanine Tesori (Caroline, or Change) and Tony-nominee Lisa Kron (In The Wake, Well) comes a fresh, daring new musical based on the acclaimed graphic novel by Alison Bechdel. When her father dies unexpectedly, graphic novelist Alison dives deep into her past to tell the story of the volatile, brilliant, one-of-a-kind man whose temperament and secrets defined her family and her life. Moving between past and present, Alison relives her unique childhood playing at the family's Bechdel Funeral Home, her growing understanding of her own sexuality and the looming, unanswerable questions about her father's hidden desires. 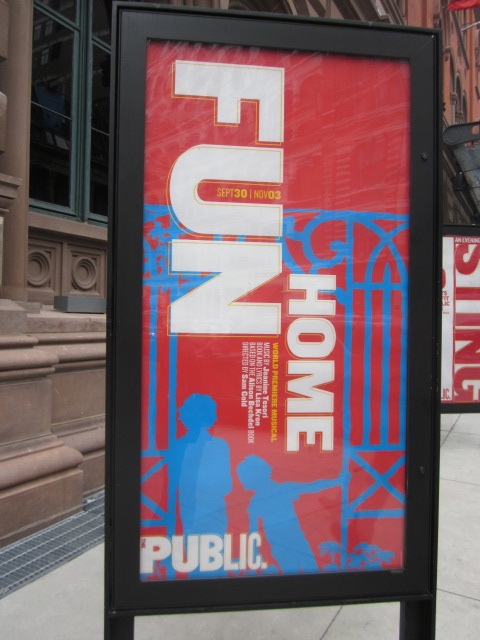 Directed by Sam Gold, FUN HOME is a groundbreaking, world-premiere musical about seeing your parents through grown-up eyes. Well? This was my first time seeing Alexandra Socha's replacement as Medium Alison, Emily Skeggs. I couldn't have been more impressed. Her performance was fresh and poignant and charming. My friend loved the show as well, and we enjoyed talking through our thoughts afterward. Seat Happy? We were 3rd row center...yep, I was happy :). What? 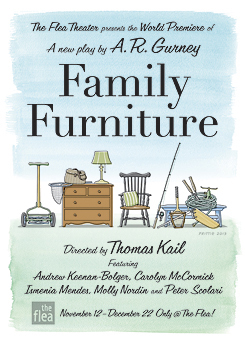 From the show website: Family Furniture is a coming of age tale about a family and one certain summer when everything shifts. Gurney gives us Buffalo, gin and tonics, tennis doubles with the Baldwins, vichyssoise and so much more in this heartfelt tale about parents and children. Well? Not surprisingly, Peter Scolari and Andrew Keenan-Bolger (my two main reasons for seeing the show) did not disappoint. I really love Peter Scolari's ability to be vulnerable and accessible on stage. He always makes me feel as if we could just sit at a pub somewhere and gab like old friends. Andrew's taut energy crackled, and I completely believed his performance as the son walking the tightrope of family dysfunction. Seat Happy? This is a very steeply banked house, and we were towards the higher section, and over to the side of the row. I think for a spare, vulnerable show like this, I would have preferred to have been closer to the stage area. What? 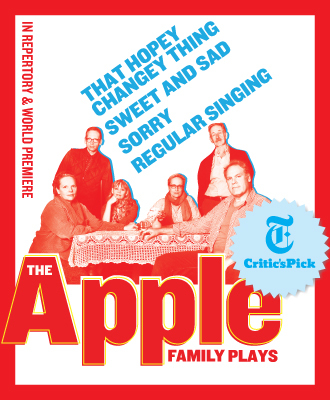 From the show website: Each year since 2010, Tony Award winner Richard Nelson has premiered a new play at The Public about the fictional, liberal Apple family of Rhinebeck, New York. This year, the award-winning ensemble that has come to embody Nelson's fascinating family will be reunited once more as the first three Apple plays triumphantly return, in repertory, along with the world premiere of the fourth and final play in this powerful and timely series.These plays about family, politics, change, and the way we live today burst with remarkable immediacy. 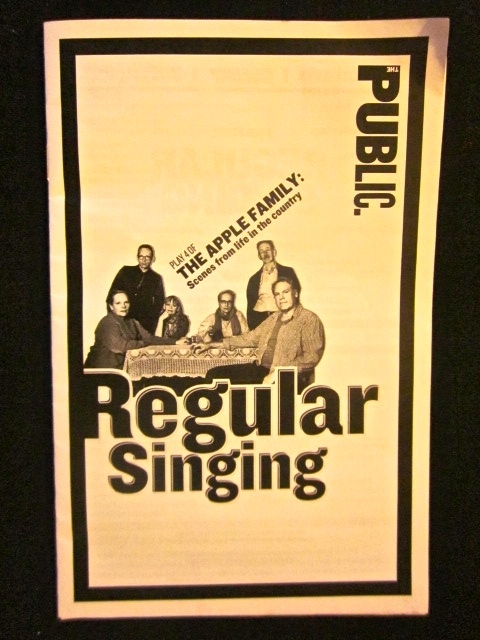 Each of THE APPLE FAMILY PLAYS originally premiered on the night on which it is set. In THAT HOPEY CHANGEY THING, the Apples reflect on the state of their family and discuss memory, manners and politics as polls close on mid-term election night 2010 and a groundswell of conservative sentiment flips Congress on its head. In SWEET AND SAD (The New York Times, New York Magazine, Bloomberg News, Top 10 of 2011) a family brunch stirs up discussions of loss, remembrance and a decade of change. And SORRY (The New York Times, New York Magazine, The Daily News, Bloomberg News, Top 10 of 2012) which premiered last fall, finds the Apples sorting through family anxieties and confusion on the day of electing the President. Well? I was glad to see this latest play in the series (I saw the first in the series, That Hopey Changey Thing at Studio Theatre in DC in November), set on the day of the 50th anniversary of JFK's assassination. The fluid, natural rhythm of Nelson's work is unlike any other play I've seen; it's as if you are an invisible observer who has wandered in to a house full of people, with no prior knowledge of what you'd see and hear. I do think that I enjoyed this more as part of this series; I'm not sure I would have appreciated it had I not already been introduced to the Apples, and knew a bit about their relationships. Seat Happy? I was in the upper rows of this amphitheater-style venue, but the sight line was good. However, because of the "realistic" nature of the staging and dialogue, the distance sometimes made it difficult to hear all the lines. The actors were only amplified by a series of microphones suspended above the stage, making the amplification a bit inconsistent. Well? 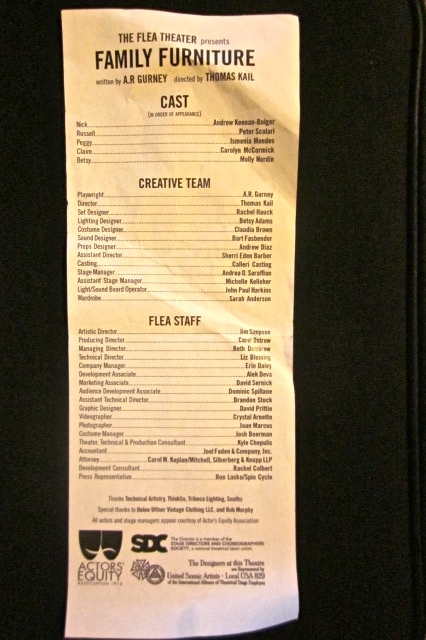 I cannot ever complain about seeing this company of actors on stage. Mark Rylance is truly a gift. 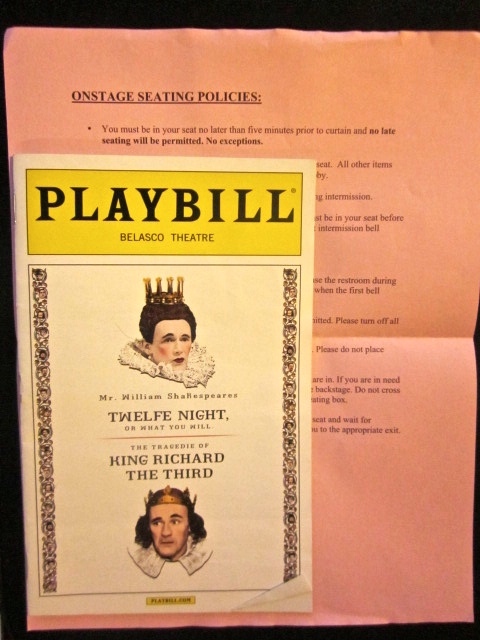 I had taken the opportunity to grab one of the onstage seats when I saw it was available (I'd wished I'd been up there for Twelfth Night), and that proved my undoing. The show had attempted to squeeze too many people in the cramped stalls, and we were all wedged in so tightly, that no one could shift a muscle. I loved being up close and personal with the action, and especially loved watching the pre-show ritual of costuming the actors on stage. 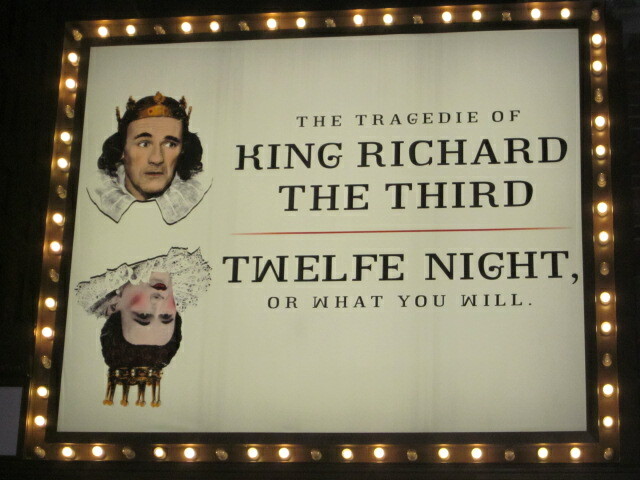 Rylance's Richard was particularly brutal in his nonchalant cruelty, and I was glad that this was my first experience with the play. Seat Happy? As noted, this was not a successful seating experience for me, unfortunately. I'm not sorry I experimented, but I'll be a little more cautious in the future (maybe looking for online comments from others first). What? From the show website: An unspeakable tragedy. A shattered family. An accusation of murder. 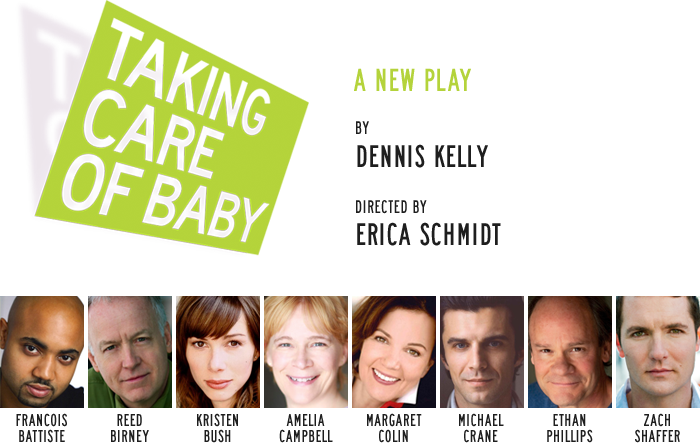 TAKING CARE OF BABY is a provocative new drama that boldly explores the elusive nature of truth and the depths we'll go to expose it. Francois Battiste (Magic/Bird), Reed Birney (Blasted, Our Leading Lady), Kristen Bush (Kin, The Common Pursuit), Amelia Campbell (A Streetcar Named Desire, Our Country's Good), Margaret Colin (The Columnist, "Gossip Girl"), Michael Crane (Bloody Bloody Andrew Jackson Off-Broadway), Ethan Phillips (Golden Age) and Zach Shaffer ("Smash") star in this American premiere by Tony Award® winner Dennis Kelly, directed by Erica Schmidt (Humor Abuse, Invasion!). Well? This was one of those shows during which I found myself marveling at the performances, but not completely connected to the story. The staging was spare (as it generally is at Stage II, which is a very flexible black box space), and while I usually really appreciate the focus on the actors and action, instead of the set, I'm not sure it worked as well in this case. Perhaps there was too much story being fit into too little show. That said, I really love Margaret Colin, and enjoyed seeing her showcase her range, which veered wildly from ambitious politician to devastated mother to old friend. Seat Happy? I was front row, but way over to one side of the stage space. Great view of the action, and fun to be right where the actors entered and exited sometimes. My main complaint was the behavior of some of my fellow audience members, not limited to one older gentleman audibly snoring behind me and the woman next to me pulled out her cell phone mid-show, to leisurely check her text messages, email (yes, I could see what she was doing because her phone was practically in my lap). What? 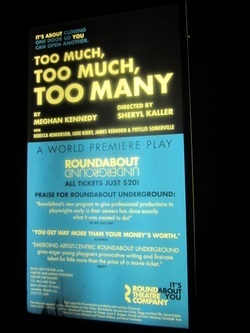 From the show website: Now in its seventh season, Roundabout Underground presents a vibrant New York premiere by up-and-coming playwright Meghan Kennedy. Tony Award nominee Sheryl Kaller (Broadway's Next Fall) directs this bittersweet, poignant and touchingly funny drama about the walls we build to protect our hearts––and deciding when it’s time to break them down. Well? Such a fascinating contrast to the show above. This was a big story with big emotion on a very small stage space with a detailed set, with restrained and lovely performances and it all fit perfectly. An adult daughter trying desperately to reach her widowed mother who is, in turn, trying to make peace with her beloved husband's death (which may, or may not, have been self-inflicted), somehow found laughs amidst the pain. Seat Happy? This was my first time in the Roundabout's basement black box space, and I would definitely go back. It's intimate, but roomy (as evidenced by the full set). The seating was general admission, so I chose to be in the front row all the way to the side, as I feared having someone's head blocking my view otherwise. It was a good decision, as I was literally a few feet from the actors at times. I could tell from the set that action would take place on both sides of the stage and in the center, so I figured that any angle would be fine, and that was definitely the case! What? From the show website: Love, Linda is a tour de force musical and theatrical journey, starring acclaimed jazz vocalist Stevie Holland. 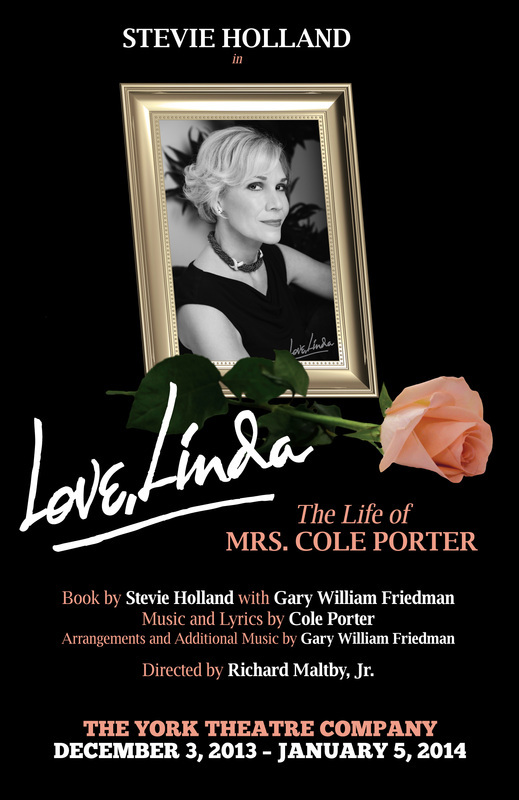 This musical explores the life of Linda Lee Thomas, the Southern beauty who, at the dawn of the Roaring Twenties, married and was a driving force behind legendary songwriter Cole Porter. Though Porter was gay, their companionship lasted through a 35 year marriage. Love, Linda celebrates the deep love shared by Linda and Cole, while examining the darker sides of their life. Well? I enjoyed this peek into two very interesting lives. Stevie Holland has a great ease with the musical style, and as a cabaret, the show was satisfying. My reservations were with the somewhat stilted transitions between the songs and the musings that told the story, which kept the show from giving me the natural storytelling I think I wanted. Seat Happy? 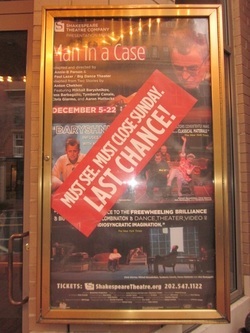 I was in the center of the front row, which was fine, but York is a small theater, so most seats have good sight lines. It is steeply banked, however, so the upper rows can feel a little far away. What? From the show website: Two of the world’s most gifted sleight-of-hand artists, Derek DelGaudio (2011 & 2012 Close-up Magician of the Year) and Helder Guimarães (2011 & 2012 Parlour Magician of the Year) star in this uniquely unconventional magic show, directed by Emmy Award winner Neil Patrick Harris. Through a series of diverse and engaging vignettes, Nothing to Hide leads the audience on an amazing and memorable journey into a world of pure astonishment. Well? In a (hyphenated) word, this hour's worth of unique and wildly entertaining magic and illusion was mind-blowing. But it was more than just the tricks; these two performers are masters of the art of entertaining itself, both comedy and drama. They had the audience in their thrall from the first silent, elaborate chess-like match of back and forth card tricks, through the boisterously, rapid fire, hilarious (and amazing) finale. I will absolutely see this pair any chance I get. Seat Happy? Perfect. First row, close to center, and for a magic show, being close to the action enhances the experience! What? From the show website: Long before she was Carole King, chart-topping music legend, she was Carol Klein, Brooklyn girl with passion and chutzpah. She fought her way into the record business as a teenager and, by the time she reached her twenties, had the husband of her dreams and a flourishing career writing hits for the biggest acts in rock 'n' roll. But it wasn't until her personal life began to crack that she finally managed to find her true voice. BEAUTIFUL tells the inspiring true story of King's remarkable rise to stardom, from being part of a hit songwriting team with her husband Gerry Goffin, to her relationship with fellow writers and best friends Cynthia Weil and Barry Mann, to becoming one of the most successful solo acts in popular music history. Along the way, she made more than BEAUTIFUL music, she wrote the soundtrack to a generation. Well? Jessie Mueller gives, hands down, one of the most captivating performances I've seen in years. Carole King's music provided the heart and soul of my teenage self, but the music she and Gerry Goffin wrote together takes her influence in my life even farther, which makes this a very personal experience for me. King and Goffin had a tumultuous and therefore fascinating relationship; the kind from which great stories are born. That relationship also resulted in a dizzying array of pop hits that live on as iconic American music. And as marvelous as Mueller and Jake Epstein (Gerry Goffin) are as stage partners, they are very nearly upstaged (in all the right ways :) by Anika Larsen and Jarrod Spector as King/Goffin's contemporaries, Cynthia Weil and Barry Mann, who also made unmatched contributions to popular music of that era. Larsen and Spector have an absolutely charming chemistry, and all four of these principle actors have fantastic voices! The first act treats us to a lot of the King/Goffin hits, and Act II is more story-driven, and ultimately more satisfying. Seat Happy? I was third row, center left the first time, and in the third row on the right side section aisle the second time. Both were great, but I think this is a show that probably doesn't really have a bad seat. The set is multilevel, and large scale, so you don't really need the intimacy of a close seat. What? From the show website: Watson: trusty sidekick to Sherlock Holmes; loyal engineer who built Bell’s first telephone; unstoppable super-computer that became reigning Jeopardy! champ; amiable techno-dweeb who, in the present day, is just looking for love. These four constant companions become one in this brilliantly witty, time-jumping, loving tribute (and cautionary tale) dedicated to the people—and machines—upon which we all depend. Well? Charming, provocative and funny. John Ellison Conlee is just such a versatile and likable actor; he's wonderfully accessible, yet complex and interesting without over-layering. John the actor, becomes fully integrated with whatever character he's playing. In this play, that meant multiple, distinct and very different personalities, all of which I was happy to see enter a scene. His costar, Amanda Quaid, was also so compelling, with a believable chemistry with her "artificial" companion (in the form of Conlee). The story was a little tangled, but I didn't mind...it was absorbing and surprising in the right ways. Seat Happy? I was in the second row, all the way left. It was absolutely fine; I didn't miss anything on stage. What? From the show website: The enduring music of Burt Bacharach is given new life in this energetic evening of musical celebration. Twenty-five-year-old musician and actor Kyle Riabko (Spring Awakening, Hair) performs his unique, soulful arrangements of the Bacharach songbook backed by an eclectic group of young performers. Steven Hoggett, whose award-winning choreography was featured in such diverse pieces as Once, Peter and the Starcatcher, and Black Watch, returns to NYTW for a third time. What's It All About? 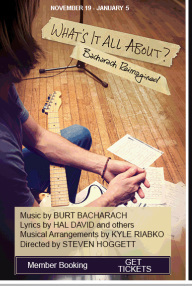 is a reintroduction to the timeless music of Burt Bacharach through the eyes and ears of a new generation. Well? A lovely, unexpected, meandering (in a good way) journey down a new path with the beloved songs of one of my favorite composers. I loved the music, but the set and the movement choreography by Hoggett were so lush, intimate and perfectly suited to this show, that they took my breath away. Hearing these familiar songs interpreted with such grace, respect and freshness was delightful! Kudos especially to Kyle Riabko. Oh, and leaving the theater in the drippy rain and being greeted by the cast across the street serenading us with Raindrops Keep Falling On My Head, was sheer joy! Seat Happy? YES! I was able to snag a seat in an armchair on the stage. What can I say? Heaven. What? 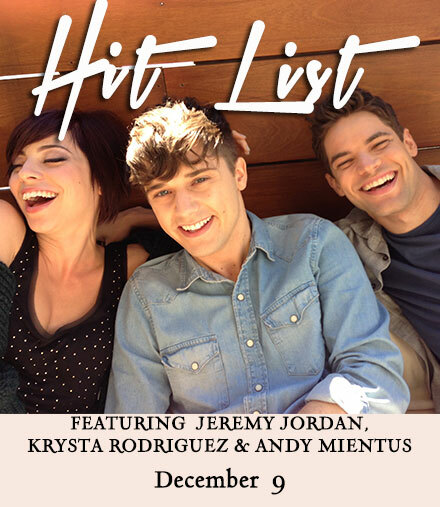 From the show website: The second season of NBC’s Smash featured a fictional new Broadway musical called HIT LIST, written by characters played by Jeremy Jordan (Newsies, The Last 5 Years) and Andy Mientus (Carrie, Spring Awakening), and starring Krysta Rodriguez (First Date,The Addams Family). The fictional musical opened at Manhattan Theatre Workshop and then transferred to Broadway, opening at the Barrymore Theatre and winning seven Tony Awards. HIT LISTthe musical will receive its actual world premiere performance at 54 Below. HIT LIST, a modern fable about identity and the price of fame, tells the tragic love story of a wannabe pop singer who transforms herself to become a star and the hidden songwriter she uses to get there – but at what cost? HIT LIST will be presented by Julia Brownell, Joshua Safran and Jennifer Ashley Tepper. Benjamin Rauhala is musical director. The concerts will feature a full band. The score of HIT LIST was written by Drew Gasparini, Joe Iconis, Andrew McMahon, Benj Pasek & Justin Paul, Marc Shaiman & Scott Wittman, and Lucie Silvas. The shows will include some additional songs from these composers that were intended for HIT LIST but never made it to air, and also special appearances by several of HIT LIST’s composers and additional performers to be announced at a later date. Well? What can I say? It was a dream come true to see such a talented group of performers bring a fictional show within a fictional show to life in the intimate setting that is 54 Below. A big plus was the rabidly enthusiastic audience, who couldn't get enough of the songs, and the bits, and the musicians, and the actors and, well, EVERYTHING!! Such a great night. Seat Happy? There really is not a bad seat in this venue. Some of the show even took place in the bar area. I was right up next to the stage (Andy Mientus bumped into me a couple of times as he went up and down the stage steps :)). Wouldn't have traded with anyone :). What? From the show website: Broadway legend Maurice Hines teams up again with the unforgettable Manzari Brothers for the first time since the smash hit production of Sophisticated Ladies to tap us through his incredible career in show business. With song and dance, Hines pays tribute to his brother, Gregory, and the singers who have inspired him, from Frank Sinatra to Lena Horne. To help bring the history of American tap to life, Hines brings The Diva Orchestra, an all-female nine-piece big band. Get ready to laugh, smile and tap your feet to the infectious song and dance of Maurice Hines! Well? What a thrill to see this legendary performer on stage. His stories of growing up in the racist performing arts environment of that era were heartfelt, poignant, sometimes painful, and always entertaining. Seat Happy? Fourth row, center on the aisle. It was great. The Kreeger Theater at Arena, is the only one of the three spaces that give me pause with seat selection. There are some seats that are less than desirable; particularly the ones farthest over to the left or right of the orchestra. And the rear orchestra and make it challenging to see over those in front if you're on the short side (I'm guessing the pitch, seat height are to blame). What? From the show website: It’s the end of the world as we know it. A flood of biblical proportions leaves us with only two people on Earth, who discover their common language is song and dance. Together they chronicle the rise and fall and hopeful rise again of humankind, through music that runs the gamut from Rodgers and Hammerstein to Sondheim, R.E.M. and Queen. 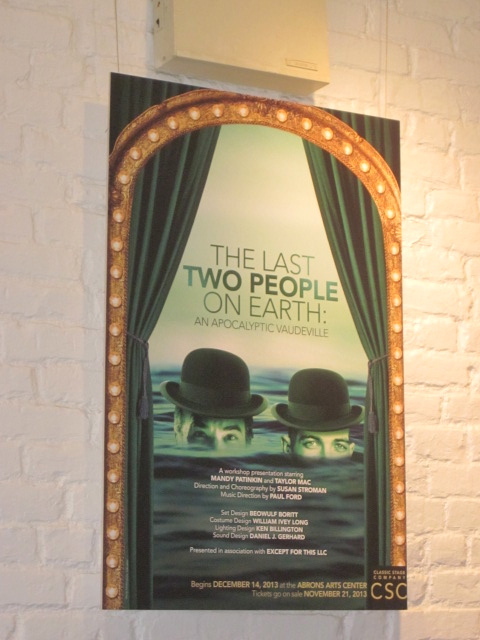 Join us for this fully-staged workshop presentation of THE LAST TWO PEOPLE ON EARTH: AN APOCALYPTIC VAUDEVILLE and become a part of the discovery process as these stellar artists continue to fine tune this remarkable new music theatre piece. Well? I have rarely been in the presence of such quirky and magical genius, such as that displayed by the insanely talented Taylor Mac and Mandy Patinkin, who made the most appealing couple on stage. It would be hard to capture the whimsy and hilarity of this abstract piece in words, but suffice it to say, it was unique in all the right ways! Seating happiness? Very happy. First row, all the way right. So great to see these great performers up close. I also got visual proof of the "sweat equity" theater requires :). What? 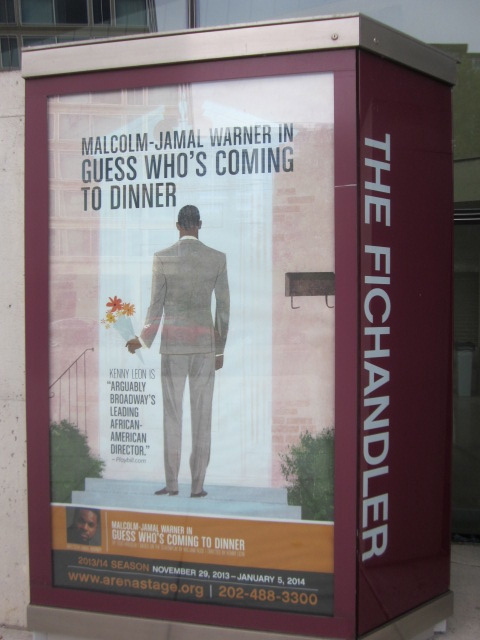 From the show website: Television actor Malcolm-Jamal Warner (The Cosby Show, Malcolm & Eddie) makes his Arena Stage debut in a new adaptation of the beloved film Guess Who's Coming to Dinner. A progressive white couple's proud liberal sensibilities are put to the test when their daughter, fresh from an overseas romance, brings her African-American fiancé home to meet them. Personal beliefs clash with the mores of the late 60's in this warm and witty exploration of family and culture and knowing which of them has the greater hold on our hearts. Well? So much humor. So much heart. Such wonderful performances, especially from Malcolm-Jamal Warner and Bethany Ann Lind, as the couple at the center of the storm. They were so believable; playful and natural with each other, and each actor has such impressive timing and sensitivity to the audience. The set is gorgeous, and the surround of the Fichandler, made it feel as if the audience was really just peeking into a house to observe the lives of those within. I attended the talkback with the cast after the show, and it was particularly interesting to hear how they dealt with a period piece being brought to current day. Everyone agreed that there's still such a strong need to confront the bias that remains in society. They also talked about finding the humor in the otherwise serious, and painful, family situations, but not playing to the laughs. Instead, they kept it natural, and let the audience find their own laughter. Seat Happy? I really like the Fichandler venue; it's "in the square" set up, and related staging of the shows, really provides great sight lines from all the seats. It's just a matter of how close you want to get to the stage. I was about 4 rows up, and it was fine. What? From the show website: "Here she is, World. Here’s Rose! Sherri L. Edelen (The Best Little Whorehouse in Texas, Company, Hairspray) stars as the iconic Momma Rose in the award-winning backstage musical favorite. Set during the 1920s fading vaudeville circuit, Gypsy portrays the rise of famed burlesque performer Gypsy Rose Lee. Momma Rose, the archetypal stage mother, steamrolls everyone in her way to propel her daughters into child stars. When the younger, more talented, daughter defects, Rose sinks all her hopes (and claws) into the elder. Bold, brassy, yet remarkably charming, Momma Rose puts today’s Dance Moms to shame. Well? The marvelous Maria Rizzo stole the show for me. The famous songs were done so well, and I thought the cast had great chemistry. Sherri Edelen made a perfect Mamma Rose; this is my favorite role I've seen her play. I also constantly marvel at the talented set designers who make such amazing use of limited space on The Max stage. Seat Happy? Yep. Second row, center. I am generally happy with my seats at Signature. It's one of the great things about going to see smaller productions. You're never too far away. What? From the show website: "In Chekhov’s brilliant tale of humor and despair, a pair of hunters talk late into the night sharing stories: one of an anti-social man and his involvement with an aggressively extroverted woman. The second, a tale of moral ambiguity in which the protagonist forgoes his love for a married woman. Drawing from surveillance footage, folk dance, and instructional hunting videos, MAN IN A CASE creates a bridge between our time and that of these 19th-century anti-love stories. Annie-B Parson and Paul Lazar, the team behind the internationally acclaimed Big Dance Theater, bring their signature style to this irresistible evening of live performance and mixed media. Well? It always delights me to see something that's so unexpected. In the midst of the sometimes seemingly random action, Mikhail Baryshnikov's deeply intense (and mostly wordless) presence really touched me. His graceful movement was mesmerizing. I also loved the use of the mixed media, and creative staging. I was never quite sure what would happen next, and that's rarely a bad thing. Seat Happy? Third row center, and it was a great seat. Although, The Lansburgh Theatre is another venue that is small enough that most seats are good. This is helpful when you're able to get a discount ticket, as you will likely still be happy with your seat.